Most of you know something about Father Benedict Joseph Groeschel, but there is much to know, so I thought I'd begin with some details taken from his official obituary, with a few additional comments of my own. reforming religious community started in 1987 by eight Capuchin Friars based in New York City. 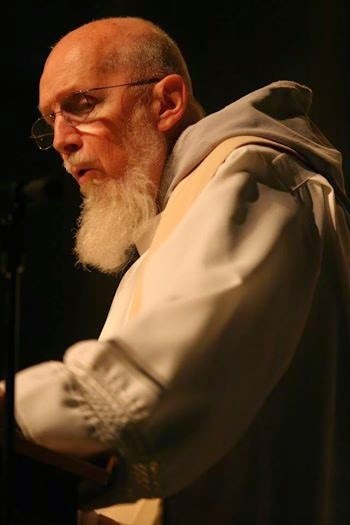 He had been ordained for the Capuchins, a Franciscan order, and trained as a psychologist at Columbia University. He put his remarkable gifts and multiple skills to work as director of spiritual development for the Archdiocese of New York, director of a retreat house for priests in suburban Larchmont, New York, and taught Pastoral Psychology for many years at St. Joseph’s Seminary. He was particular noted for the compassionate and professional help he provided to bishops and priests experiencing personal difficulty. Alongside these enduring commitments, Fr. Benedict was a renowned writer, preacher, retreat master, and evangelist on Catholic television. But his greatest joy was serving the poor and underprivileged. Founder of St. Francis House and Good Counsel Homes, he served for fourteen years as chaplain at Children’s Village, a residential facility for troubled children. The night after Father Benedict died, I was called to anoint a women at the emergency room of the local hospital. The patient was conscious and devout, so we had a nice chat, about confession among other things. During our conversation, the sick woman quoted "the friar from EWTN." Realizing that she was speaking about Father Benedict, I told her that he had just died. We then talked about her memories of his teaching and his engaging style; it comforted both of us--I in my sadness, she in her illness. It struck me forcefully that I'd just glimpsed something of the influence of this tireless preacher of the Gospel. Less than 24 hours after his death, and thousands of miles away, Father Benedict's influence lived on. And live on it will, not least in the books that capture some of his countless words. My own stack, made up of gifts received over more than a quarter century of his kindness, is almost a foot high and would be higher still if my parishioners and friends were better at returning books they borrow! Of his many books, there's no question which was the author's favourite: I Am With You Always, a study of personal devotion to Jesus Christ among Protestants, Orthodox and Catholic Christians, was Father Benedict's magnum opus, and he was justly proud of it. My own favourite was Stumbling Block and Stepping Stones. In this 2002 book, Father Groeschel provided spiritual answers to psychological questions, combining his deep knowledge of Christian spirituality with his early training as a psychologist. But the book that comes first to mind on the day of his funeral is Travelers Along the Way: Men and Women Who Shaped My Life. The obvious reason is that Father Benedict was a man who certainly shaped my life over many years. The other reason is that the table of contents of that book could form the outline for a biography of this remarkable man. In the 28 chapters of Travelers Along the Way, we meet Mother Teresa, no fewer than three cardinals, and some very distinguished theologians. But we are also introduced to Mr. Graff, an Orthodox Jewish dry cleaner he knew in childhood, and Sister Teresa Maria, who taught young Peter Groeschel--as he then was--in grade school. Without doubt, Father Benedict was no respecter of persons. He moved easily with the famous and indeed with the rich, on whom he relied to help the poor of New York City, his greatest love. He told me once that I could reach him in California, where he was giving a retreat at The Gallows, which I thought was a terrible name for a retreat house. I was much relieved to discover that he was actually giving a retreat on the estate of the wine-making Gallo family! Perhaps because of his health problems, but more likely because of his perspective on life, Father Benedict often spoke of the life to come. He was very attached to the doctrine of Purgatory, reassuring many of us by his fondness for the place. He often remarked that he'd be quite satisfied to land there when his time came, because everyone in Purgatory knows they will end up in Heaven. Somehow I don't think he will be given the experience; his sufferings in later life were more than enough to prepare him for an express trip to the Kingdom. Although Travelers Along the Way was written four years before he died, it looked ahead to his ultimate destination. "Even though many of these fellow travelers have gone home to God long ago," Father Benedict wrote, "their influence persists as I continue my journey along life's way. I look forward to encountering them once again in the life that infinitely transcends this one, the eternal life we have been granted through the life, death and resurrection of Jesus Christ, the life that is the ultimate goal of all journeys." I'm confident that Father Benedict's influence on me will persist for the rest of my journey; I am equally confident that he has not only encountered his friends again but that he has now met face to face the one Friend he served so tirelessly and so well as priest, preacher, and shepherd of the poor. What a beautiful send off!